1. 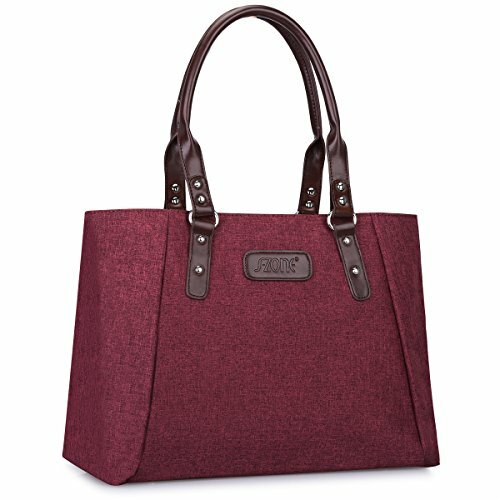 This modern deluxe tote bags is made of polyester-cotton, it is easy to clean and long lasting. Double flat shoulder handles structured shape adds this bag a stylish appearance. 2. Classic & simple design, compact and lightweight is a timeless choice for day-to-night sophistication. Perfect for using in office, school, travel or any other daily occasions. 3. Large roomy open compartment provides ample storage with quick and easy access for all of your essentials.Such as umbrella, books, mobile, wallet and other items can be placed. 2. When not use for a long term, please tightly wrap it into the bag and place in a cool and dry. Dimensions (L x W x H): 13.8" x 5.3" x 11"/35 x 13.5 x 28 CM, weight: about 1.32 lbs/0.6 kg. Durable Materials: This handbag is made of soft polyester-cotton, tear and wear resistant. And high quality PU leather strap. Large capacity and lightweight. Please note that polyester-cotton is not structured material. Only the bag is full of stuffs, will it be structured as the pictures show. High quality silver hardware. Silver metal rivet protect on bottom. Big Capacity: Top zipper closure for your security, the main compartment can accommodate a 15.6'' laptop. 1 interior zippered pocket, and 2 organized pockets for cards or mobile phone. 1 magnetic snap pocket at back, convenient to hold little stuffs. Multi-purpose: The handle height is 8.7"/22 CM (long enough to put on shoulder), double flat shoulder handles, you can carry it as a top-handle bag or a shoulder bag. Great for vacation, work, travel, shopping, and any other daily occasions. Perfect gift idea! If you have any questions about this product by S-ZONE, contact us by completing and submitting the form below. If you are looking for a specif part number, please include it with your message.